The story of Ali Gaffar Okkan, the assassinated police chief of Diyarbakır, tells us about the life of an extraordinary Turkish officer. He devoted his whole life to reconciling the Turkish state and the Kurdish people, whose relations have been always under attack by terrorism for many years, particularly during his term in office in the southeastern city of Diyarbakır. 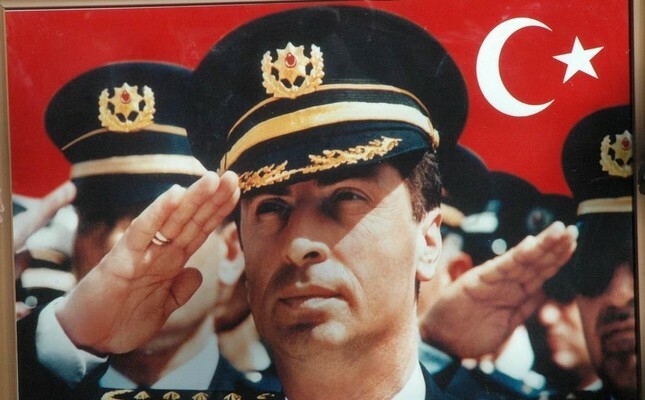 With his reformist deeds and unprecedented way of warm communication with people as a police chief, Okkan, today on the 18th anniversary of his death, is commemorated like a hero that revolted against a fearful campaign followed in the entire region to drive a wedge between the Turkish state and the Kurds. Born in the Hendek district of the northwestern city of Sakarya, Okkan was the son of a middle-class family. His father was a baker and his mom was a housewife. "I'm not interested in the high ranks, if I cannot find something to do; I would return to my father's bakery and sell bread," Okkan would say. He was like a lone wolf, sacrificing his life for one purpose: Fighting against terrorism. close friends say that he was happy to be appointed as the head of the police department in Kars, yet he had a dream of being the Istanbul police chief one day. In 1997, the Ministry of the Interior unexpectedly appointed him to the Diyarbarkır Police Department. In the '90's, Diyarbakır was a terror hotbed where the outlawed PKK would brainwash people, threaten or sometimes even kill whoever did not follow its separatist doctrines. Besides the PKK, there was another active "terrorist group called Hezbollah which had secretive relations with some unknown officers [still unidentified] within the state institutions," as Okkan expressed. According to Okkan, there were some officers in the state and police department working with Hezbollah under the pretext of fighting against it. Just like the PKK, this terrorist group would organize assassinations and was responsible for numerous unidentified murders in the country, as reports confirm. In short, being a police chief in such a city in such a period of time meant that your life was constantly under attack; or you had to turn a blind eye to all those terrorists and conduct your business according to their aims, which is to provide security for them. Okkan didn't choose the latter. On his first day in office, Gaffar Okkan made an announcement on police radio, giving some unusual orders to officers. "I have been walking around the city center for two days and I see that some of our officers are not aware of their real duties, this is my fist and last warning to all of you," Okkan signaled a major change at the door for the police department. According to him, it was not fair to see policing as a desk job; instead, all they needed to do was to be on streets to help people and behave kindly to them. With Okkan's arrival to the department, a reformation process immediately started; he charged female officers to take care of older people, set up a giant video surveillance system to watch what's going on at nights in the city, started walking daily on streets in the city center, talking with people and giving an ear to their problems which was very, very unusual since even low-ranking officers or politicians hadn't taken into consideration the local people until his term. Fearful during this process, some of his friends asked him to use an armored vehicle, but "If I get in an armored vehicle, what would the people do?" Okkan would respond. On the first occasion, Okkan launched massive counterterrorism operations against Hezbollah, dealing a big blow to its criminal networks in Diyarbakır and busting some drug gangs as well. Thanks to these operations, Okkan, in one particular instance, played a big role in the detention of the Hezbollah leader Hüseyin Velioğlu in Beykoz, Istanbul. At a press conference, he declared that his team was soon about to uncover the true structure of the Hezbollah terrorist group. "We confirmed that this terrorist group [Hezbollah] tries to portray things as if the state was behind the terrorist attacks," said Okkan. "It [Hezbollah] is a hit man group backed by some foreign circles... Peace in Diyarbakır means peace in Turkey. Since Diyarbakır is the Turkish stage of a great scenario played over the world," he highlighted the importance of the fight against terrorism in Diyarbakır. Okkan was like a savior proceeding step by step to completely end the years-long resentment between Kurds and the Turkish state. Being aware of the simple discrimination between terrorism and the local people, he knew well that neither the PKK nor Hezbollah represented even one single Kurdish person as it was claimed by some media outlets and politicians. Acting as more than a police chief, he was becoming a real legend that was winning the Kurdish people's minds and hearts. Was he really the one that could have saved the people from the curse of terrorism? I think the answer is yes, if the story had not ended with a horrible incident in 2001. January 24, 2001 started like an ordinary day when Okkan left his office at around 5 a.m. to go to the governor's building with five officers in an official car. A short while later however, he suddenly found himself in an ambush. He and his five officers were assassinated in nearly five minutes of gunfire. According to reports, the Hezbollah terrorist group is behind this murder, but to be honest, there seems to be something bigger behind this unprecedented assassination, which still remains unidentified. Simply put, during his term in office, there were two choices for Okkan: Ignore Hezbollah, the PKK and other still-unidentified organizations or fight against them to the death. Okkan choose the latter. That's why, he is probably the most-beloved police chief not only in Diyarbakır but also across the whole country. Although he passed away years ago when I was still a kid, now I, like the millions of Kurdish and Turkish people in the country, pay my respects to him and remember him as a hero that stood against terrorist groups and devoted his life to strengthening the brotherhood between Turks and Kurds in the country. He left a beloved memory behind, I guess, his words "I love you so much. I love my department, I love my flag. For each of my officers' family members, I'm ready to die" summarize his view on life and his job, serving as a source of inspiration for millions of people who are determined to fight against terrorism in Turkey.